We don't usually focus on an individual castle for more than one or two blog posts but we have made an exception with Hermitage Castle in Scotland. I have tried to describe the place in words (see our Halloween blog post about haunted Hermitage Castle) but photographs convey the atmosphere perhaps more strongly. 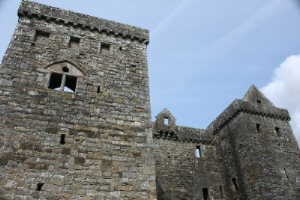 Here are 2 more photographs we took of Hermitage Castle earlier this year. On the left of the picture is the Douglas Tower - the largest of the 4 attached towers and so named because it was the Earl of Douglas who remodelled the castle in the 1370's and 1380's. Almost 2 centuries later (in 1566), the infamous 4th Earl of Bothwel was taken to Hermitage to recover from a local skirmish; whilst there, most likely residing in the Douglas tower, he was paid a secret visit by Mary Queen of Scots who was later to become his wife. On the right of the picture is the Well Tower.